I finished up the little Guy's blanket last night and left it on his bed for him to find this morning. I actually went the other day to buy some more of the yarn however the only colour they had left was the green. 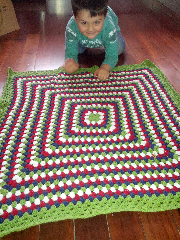 This worked out well for us in the end though as it is his favourite colour and I just did a thick green border. He looks like a happy little boy.